Marrakech has accommodation for all wallets. Backpackers may find inexpensive rooms at a much higher standard than in Europe. 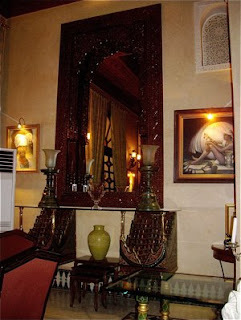 For those of you with a comfortable bank balance, there are wide range of luxurious hotels and riads, as the Palais Donab close to where we stayed in January this year. When walking through the narrow streets of the medina, you would never know that behind the gray, partly decaying walls you will find small and large riads, courtyards bought for the traders and merchants of the city of Marrakech. 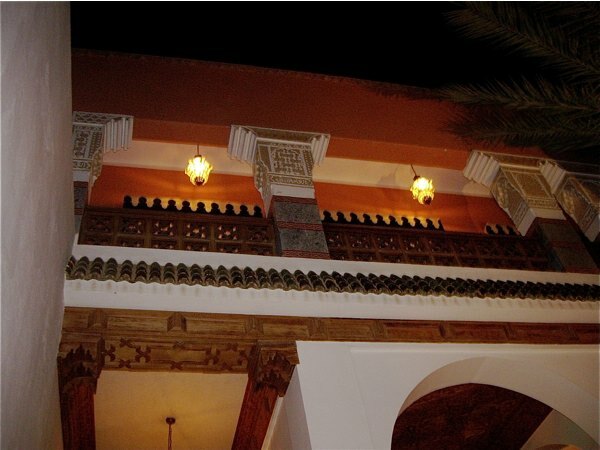 We stayed at Riad Libitibito, that I will return to later here on the site. It caught our eyes, through a menu for a restaurant and a hotel displayed in the street. The sign was tempting enough for us to look at the hotel, as well as taking a bite in the restaurant. The Palais Donab was built as a private palace. The first owner was, according to our guide, a friend of one of the Morrocan kings. Now the Palais Donab is owned by a wealthy American. The Palais Donab offers a small number of rooms, from a tiny budget single room, perfect for a lonely traveler looking for a bargain, to a Royal Suite at the ground floor with direct access to the beautiful pool area. After one of our two meals at the restaurants we were so thrilled that one of the staff gave us a private guided tour of the palace. 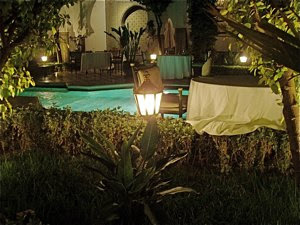 We watched the illuminated, sparkling blue water in the beautiful pool area in the mild Morrocan night. The pool area is open to the non-guests as well, at a low fee. Then we were given access to the splendid Royal Suite with large comfortable sofas, a huge bed and the most beautiful bath room I have ever seen in my long life. It can be yours from €250-350 per night depending on season. Not a bad idea for a honey moon, if you ask me!! The single room can be yours for €50-70 per night, perfect for a single travelers looking for a low-priced room in an exclusive hotel. Double room is hardly a rip-off at €130-160 per night. Rates for junior suites will vary from €160 to 200 during low season, and €200-270 during high season. And at the end of the day, you can sit down and enjoy good food in the opulent restaurant. 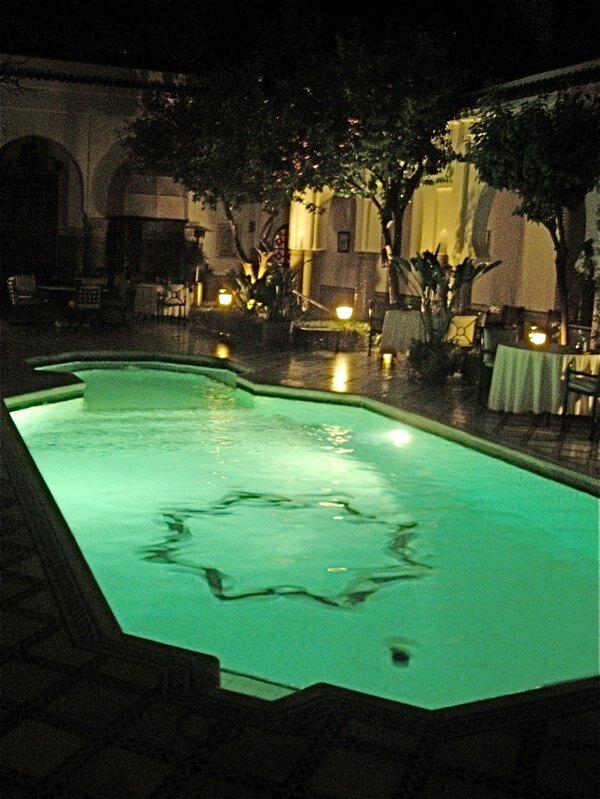 Marrakech offers high-standard accommodation at much lower prices. Due to this Palais Donab is a riad I would not consider staying during a ordinary trip to Marrakech, but I would for a special occasion. For those of you that think these rates are comfortable low, I suggest you check out the website for more information. As google maps are difficult to use to locate sites in Marrakech, this is the approximate location of Palais Donab on my map of Marrakech. 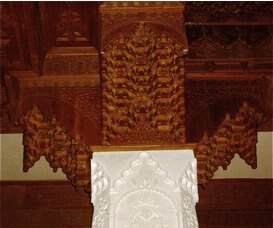 Contact Palais Donab in order to get exact location of the hotel.